It's baaaaaaaaack! After a month hiatus, I am so happy to be back at posting this weekly feature. Thanks again for your patience while I focused all my efforts on the jewelry party! 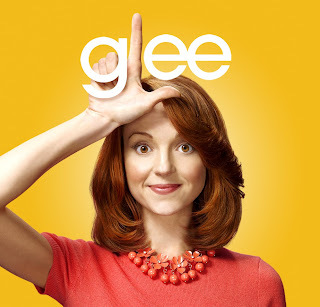 If you haven't heard of or at least seen advertisements for the new TV show Glee, I would like to know your strategy! With the World Series this and last week, fellow Glee fans have been deprived of our weekly optimistic, high school hatin', voice-over lovin', karaoke heaven. SADNESS! Well, fellow Glee lovers, hopefully this little post can at least get you whistling in the show's absence. 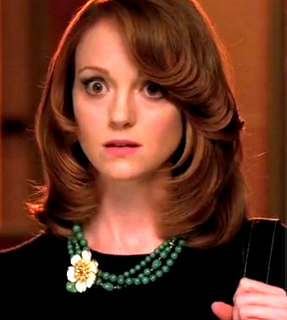 While every character on the show has a distinctive personality, and in reflection, wardrobe, my favorite character AND fashionista is of course Emma Pillsbury. 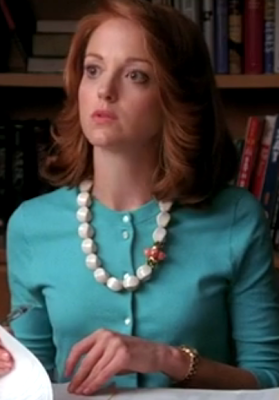 She's the sweetest little guidance counselor with an adorably awkward vintage sense of fashion. In fact, in searching for images of her online, I found not only several websites that chronicle her wardrobe at large (and where you can get similar pieces for your own closet! ), but I even found a blog that documents her adornments week-by-week (I got all my images, except the Glee image, from this great blog)! Though I am SURE I personally could NOT pull off most of her attire choices, I do LOVE her character's jewelry, especially her necklaces (For example, this quirky orange/flowery thing - only she could make this look PRECIOUS!). Example 1: This woman knows how to wear yellow! And in many ways! 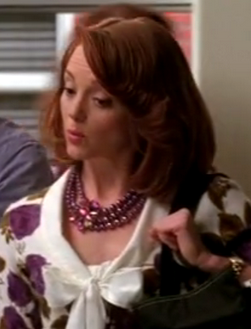 Though it's subtle, I love how she wore this necklace differently each week - both with and without collars. And even with a matching bracelet! These pieces could easily be made of glass or, even more affordably, plastic! (Speaking of plastic, notice how she's a wearing a glove before touching some food? A fellow germ-a-phobe!) Speaking of yellow, I am pretty sure I would look like a banana if I tried to pull this off. But she does it well - and with a killer necklace! I am thinking it is safe to say that her trademark is big, round, vintage-inspired colorful necklaces, each with a little signature flower. Yes? A few weeks ago I was (again) shopping in the jewelry district when I came across some colorful acrylic beads that just screamed EMMA! I just had to see if I could recreate her style yet add my own "Bead Up Trademark" to it. What do you think? It's as Emma as my wardrobe will ever get! Have a great weekend, lovies! I love Glee and emma is one of my favorite characters! I love her style on that show. I would never wear any of it, lol, but still awesome! I haven't seen the show yet but I cant wait til it's back on. I love the necklace! I love the show and her character. And yes, I noticed her fashion and jewelry too. I love seeing what she's going to wear each episode. Plus the show is darn cute.